Opening a swimming pool can seem like a big task to someone that has never done this type of work before but if you are looking to save money and have someone that can help you, then the two of you can easily open your pool if your handy and have the ability to do a bit of hard work. Before you open your swimming pool you will have to get a few tools together as well as a few chemicals to help balance the pool water. You will need a flat head screwdriver, small pair of channel lock water pump pliers, large pair of pump pliers , 10″ adjustable wrench as well as a 1/2 socket and 3/8″ socket handle. When planning to open your pool, remember to plan in enough time to remove the water and leave from the pool cover. 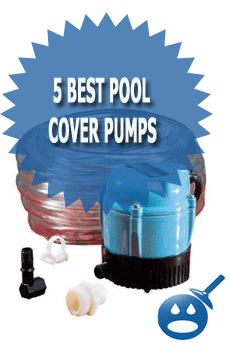 You do not want to try to remove the swimming pool cover if it is full of leaves, sticks, branches , water etc. This will cause the cover to be extra heavy and not only will you not be able to lift it, but if you try and the pool cover slips you could wind up dumping all that dirt and debris into your pool and that will cause nothing but a headache once the water clears as well as all that extra time you will spend vacuuming the pool, when instead you could have been swimming. If you have a leaf net on your pool from the winter time you will also want to remove that before removing the cover. Then off course you will want to then remove the water from the cover and the last remove the cover that is drained of all the water and all the debris are removed. The best way to remove water from your pool cover if you have the time is to use a garden hose. This is not only considered a “green friendly” way to remove water because it uses no energy, but just gravity, it also does not leave a carbon footprint and its also really easy to do. If you want to drain your swimming pool cover with a garden hose simply submerge the entire garden hose into the pool cover water removing all the air from the hose and then put your thumb over the end of the garden hose and then quickly using a forceful motion bringing the garden hose to a lower point then the other end this will create what is known as a “siphon”. If you are draining an above ground swimming pool cover this should be no problem as the pool cover is a few feet from the ground leaving you plenty of room for gravity to take its coarse. However if you are trying to drain an inground swimming pool you must make sure that you have a “low point” so that the siphon can work. You can balance your swimming pool chemicals with products you can but right from stores such as wal mart and grocery stores. There is no need to over pay at high end swimming pool dealers any longer. You can use Arm & Hammer baking soda to stabilize your Alkalinity levels as well as your pH levels. You can also pick up a bucket of chlorine tablets at any wall-mart or most home centers. If you look on the side of the large box of Arm & Hammer baking soda it will tell you how to adjust your PH & ALK levels in your pool. Arm & Hammer baking soda is sodium bicarbonate which is the same exact thing as “ALK UP” that pool centers charge ridiculous amounts of money for. The best way to connect your swimming pool pump without having leaks is to properly inspect all fitting, which includes unions, and drain plugs. Most unions on swimming pool systems with use o-rings and from time to time these o-rings will dry out causing the unions to leak. If you see a dried out o-ring just replace it. Before you screw the drain plugs that were removed from the heater, pool filter , pool pump and the multi-port, make sure you Teflon tape and thread lubricate the threads to avoid any leaks. A few wraps of Teflon tape and some thread lubricate makes all the difference between a leak and no leak. The proper way to fold a swimming pool cover is to fold it just like a Chinese fan. This will require two people in order to do it correctly. Each person will have to stand at each end of the pool cover pulling towards each other and backwards at the same time ‘folding” the cover on top of itself in 3 foot sections. One the pool cover is “fan folded” you can roll it up like a sleeping bag and tuck it away for safe storage during the summer. To remove the gizmo’s from the skimmers you will want to open the skimmer lids and screw gizmo counter clockwise until it is totally unscrewed and then you can remove it. To remove the plugs, loosed the wing nuts if they are the rubber type and if they are the threaded type of pool plugs then you might need a flat head screw driver to stick in the grove. 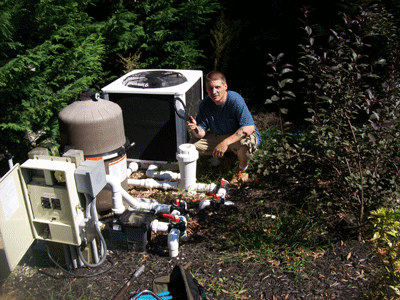 Once you have the swimming pool filter and pump all hooked up you will want to “prime the pump”. To prime the pump you will need to have a bucket full of at least 3 gallons of water. Now that you have the water you are going to want to remove the pump lid and then fill the pump volute or “wet end” of the pump with the bucket of water you have. Once you fill the pump up, replace the pool pump cover lid making sure the gasket or o-ring is properly inserted and then start the pump. 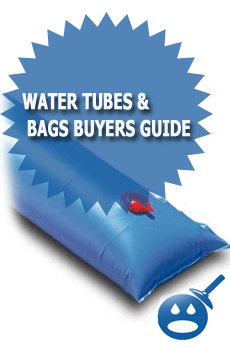 The water bag can be a great way to hold your swimming pool cover down in the winter in the right environment, but one of the problems that many pool owners face in all areas that use water bags are the storage of them during the summer. 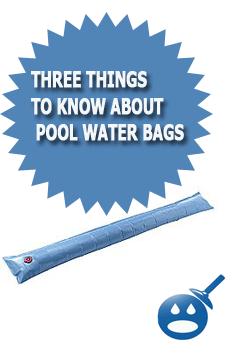 This can be a problem for many people because they were never shown how to properly put water bags away. The proper way to put a water bag away is to actually “roll up” the water bag from the furthermost end of the fill valve end. If you roll them up nice and tight you can fit many in a small milk crate. Your pool ladder and handrails will hook into something called ladder cups. What you will want to do is to insert the pool ladder or the handrails into the ladder cups and then tighten the bolt that will drive the wedge up and tighten against the ladder or handrail. If you go to insert the ladder or handrail in and the wedge is in the way, try loosening the wedge bold a few turns so that the wedge slides down a bit. Another thing you will want to do is to remove all sand and debris before inserting anything into the swimming pool ladder cups. The diving board might seem like it is hard too hook up but it only requires pushing on the rubber fulcrum and then tightening the two hold down bolts that bolt through the diving board’s rear stand. To install the diving board push the fulcrum onto the from diving board stand and then lay the diving board on the two stands with the bolt holes placed on the rear diving board stand. Once you have the holes in the diving board lined up with the holes in the diving board stand you can now slide the diving board bolts thought and tighten them down. If you have both a skimmer and a main drain in your swimming pool you will have the choice to run the pool on the skimmers, the skimmers and the main drain or on just the main drain. In the front of your pump there should be a three way directional valve that will let you control the suction of the pump, and by selecting the right post will allow you to isolate the other, meaning you can shut one side of the valve off to shut down one of the ports like the main drain or the skimmer.